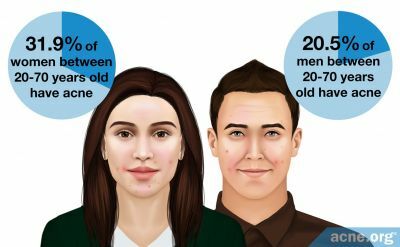 Adult acne - hormone related? 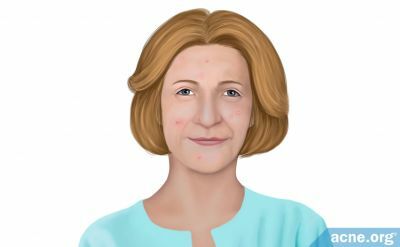 I suffered from mild acne as a teenager, but it cleared up by the time I was 19 or 20. Come 22 I started breaking out again, and now at 25 it has never been worse. My breakouts seem to follow the basic pattern of adult acne- my chin (usually in the same area, which makes it red all the time even if there are no new flareups), my jawline, and the lower areas of my cheeks. When I was 22 I went to a dermatologist, and between extractions, Tazorac, and Duac, my skin became beautifully clear. Unfortunately extractions became way too expensive, and my insurance no longer covers dermatology, so my skin is suffering again. When I stopped seeing a dermatologist and started breaking out again, I started trying to treat myself with over the counter products. When I was in college I used Proactiv and it worked beautifully for awhile until, well, it stopped working. I suspect that my skin built up an immunity to it. Clean & Clear's 10% Benzoyl Peroxide product worked for awhile, but my skin would always be either peeling off my face or incredibly oily because I'd have to use so much moisturizer. Eventually it stopped working anyway. This past summer things got even worse (and have not gotten better). I read up on adult acne and saw that it is often hormone-induced, so I went on Nature's Cure homeopathic acne pill. This worked for awhile, then I started breaking out again. Started on Neutrogena's Advanced Solutions and it worked at first, but again, only for awhile. What I did love about this regimen was that their moisturizer took care of any dryness without excess oil. Unfortunately you cant buy this moisturizer individually. Finally, I started using Clean & Clear's on-the-spot salicylic acid treatment. I put it all over my face and it was never drying, and really started to clear me up. Like everything else, it stopped working as effectively, though it still does work mildly. I came on acne.org a few weeks ago and read about a regimen someone swore by, which included both salicylic acid and benzoyl peroxide. This member would wash his face with both in the evening and just salicylic acid at night (both were Clean & Clear products), and that was it. I started on this regimen and started to see results the first day. For a week my skin became progressively clearer and I thought that I had finally found something that works, but now I'm in my PMS week and I have the complexion of a 13-year-old boy again. 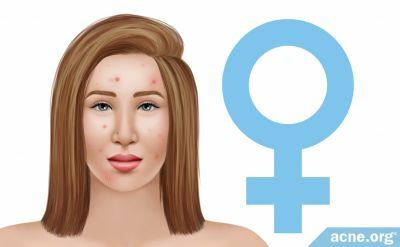 I know that a lot of women who suffer from adult acne are cured by the pill, but when I was on the pill several years ago I suffered from mild depression and severe anxiety, and it is NOT worth it to me to go through that again. This is also why I want to avoid acutane for as long as possible. I can't express enough how frustrating this process is. I would go straight to a dermatologist if it weren't for the fact that my insurance doesn't cover it, and I'm a starving graduate student. Then again I'm in a graduate program for acting, and going to film auditions with zits all over my face is both mortifying and futile. Does anyone have any advice? Specifically women, as men can't speak to the PMS issue... I'm hoping that once I'm out of PMS this month my new regimen will work again, but I'd hate to have my skin clear up and then break out again on a monthly basis. I've heard that Motrin IB helps, but I have yet to try it. Do you have insurance that will cover a visit to a primary care or family physician - or, better yet, an internist? 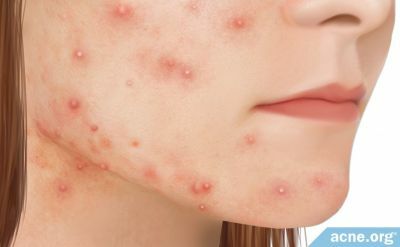 If you find a good one, he/she will know a lot about acne. If you liked Tazorac, just ask your regular doctor to write it for you. You could probably even get someone at student health to write it. I know this is dangerous, but I tend to find out about treatments on my own, then just ask my internist to try me on it. He is usually pretty amenable. 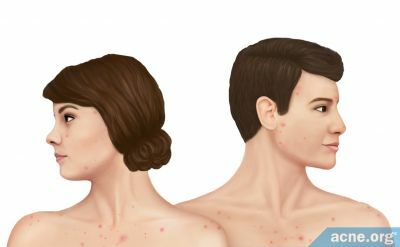 I have actually preferred talking to my internist or endocrinologist about my acne, rather than my dermalologist, because I believe there is some underlying cause of the problem. 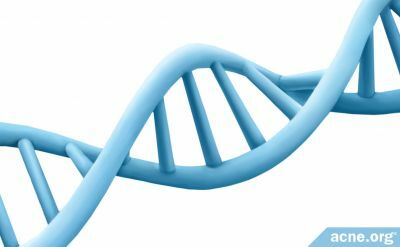 My derm tends to just focus on the state of my condition, rather than looking into other causes. Like mine, it sounds like your acne might be hormonal, and therefore, needs to be treated at the hormone level, rather than on the surface. I hear you about the pill. I am on my second month, and it is making me nutty! I don't plan on staying on it. I just started spironolactone, and hope to go off of the pill and antibiotics once it kicks in. Another option is to check out the holistic treatment posts on here and other sites. The big problem with those is that sometimes you end up spending a lot of money on a bunch of stuff that only produces minimal results. Just like the regimen says - use any benzoyl peroxide product (I always liked Clean and Clear's Persa Gel) to bleach out the redness, then moisturize with an oil-free, non-comedogenic product, then put some oil-free, non-comedogenic concealer and foundation on. Of course, you will still have the bumps, but they will be much less noticable. And, don't pick or pop! This makes them harder to cover up and makes them last longer. AND - remember to show the greatness in yourself. If you came to an audition that I was judging, and showed your talent and goodness, I would think - what a great actress/person?! - not, what a horrible acne sufferer...Nothing makes acne more noticable than a bad attitude about it. Trust me, I am always struggling with this. Thank you for all of your advice. I made an appointment with a GP on campus for tomorrow, so hopefully he/she will have some good advice. I was actually in the habit of meditating/working out over the summer when I was still struggling to keep my skin under control. Of course, these things take time to take effect and I like instant gratification, so I should start those habits again and see if it helps my skin along with all of their other benefits, of course. I've been doing some extensive reading on these boards but I'm starting to feel overwhelmed with options. Everything from cod liver oil to baby brush exfoliation seems to work for different people, so it's frustrating figuring out what will work for ME through very unscientific method. Next month I'll try Aleve during PMS as I've seen some women recommend, and see if it makes a difference! I heard extractions are bad....even if its done by a facialist. Is that true? 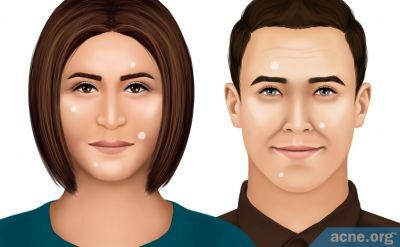 Adult acne is sometimes even more hard to deal with--because when you're young, it's "expected" you'll have some acne and you can tell yourself that you'll grow out of it. -daily multivitamin/multimineral, really reduced those little breakouts. -recently I've added Fish Oil, like it so far. -changing my pillowcases every week and making a conscious effort not to mush my face/chin into the pillow. It's annoying sometimes, but I've developed a phobia over the years about anything touching my skin, so it's hard to change. also I change my facial towels every week, if not more. -I get the regular breakouts once a month, but it's weird because sometimes I'll be clear and other months I won't be. Go figure. I've tried the Aleve thing for that though to, but I'm afraid of stomach bleeding. -Stress is a huge factor to bad breakouts. I try yoga to de-stress. good luck with the doc appt.! I went back to my GP last week and she prescribed minocycline, tazorac, and duac. This combination worked when I was seeing a dermatologist a few years ago, so I have faith that it will work again. She tried to push me to go on Yaz, but I've decided only to resort to birth control if this new regimen doesn't work. I have to say though...after only five days, I'm seeing progress. I have no new blemishes, and some deep cysts are finally coming to a head, which is usually an indication that they are on their way out. I should also note that the combination of duac and tazorac made my skin peel in a bad, bad way, but I bought a baby brush and it works beautifully. I was also worried about side effects with minocycline, but I have yet to experience any! 100mg minocycline 2x daily, on an empty stomach. Hi, when I read your story it sounded just like me! Im also 25 and my acne has started getting worse these past few years!! I've tried everything but things only work for so long. I had a baby 2 years ago and everybody said my skin would get better but it got worse. I dont want to go on the pill as last time I tried it I went fat which is replacing one problem for another. The main reason I replied to your post is because I myself am an actor also and have just got my first agent. I havnt yet been for an audition but I know if I dont sort my skin out soon i've no chance of getting work. It doesnt matter how talented I am, nobody will employ a spotty actress. I cover my face with makeup to try and hide it but you can tell I have bad skin.I feel like its ruining my life.There must be somthing out there that works and does'nt cost a fortune. I hope we find our answer soon!! I would recommend going to a GP or dermatologist ASAP. I went to my GP last week, and the combination of Duac, Tazorac and Minocycline is already working (see my above post). >Has anyone had adverse effects from using Bare Minerals makeup? Yes - Mineral makeup can break you out! It breaks me out horribly with horrible, deep cysts. I've given it two tries and have now given it up forever. Paula Begoun discusses this in her "don't go to the cosmetics counter without me" books. Mineral makeup can definitely be pore-blocking and irritating for some of us. Why don't you try something else for a while and see if you have a cyst-free month or two? Liquid foundations are more likely to stay on the surface of your skin.